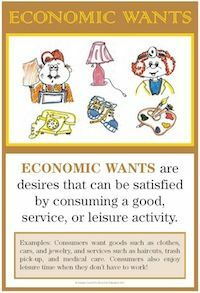 Economic wants are desires that can be satisfied by consuming a good, service, or leisure activity. Because people have differing economic wants, they purchase a wide variety of goods and services or choose to "consume" differing amounts of leisure time. Create a collage representing goods and/or services that families want. Using modeling clay, make examples of goods and services that satisfy the economic wants of people. Make a large "wishing well" bulletin board entitled, "Things That People Want." Have students classify the things they want as goods or services. List and discuss things that people want that are used to help other people or their community (e.g. food to help people in need, trees to make a city more beautiful). Take a walking tour around your school or community identifying goods and services that people want.